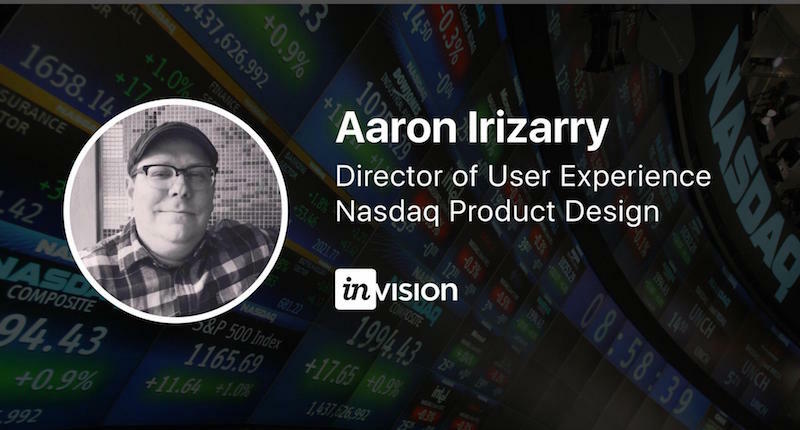 Aaron Irizarry, Director of User Experience for Nasdaq Product Design, recently sat down with Designer Hangout founder Jake Rogelberg to discuss some tips about leading teams and building an amazing design culture. Aaron’s an exceptional designer who’s so humble—and he’s just a rad human being in general. Back in the 90s, Aaron was on tour with a metal band. (Seriously, how great is that?!) They needed T-shirts, stickers, buttons, and patches, so he started teaching himself how to design them. Eventually his label asked him if he’d be willing to design some merchandise and websites for some of their other groups for some extra cash. He didn’t have any web design experience, but they provided him with some software and he got to work, this time teaching himself how to code. His design career took off from there. As time went on, Aaron started focusing more on the how and why of design, and on user experience and human-computer interaction. Though he doesn’t have a formal design background, his passion, hard work, dedication, and laser focus on being a lifelong learner have paved the way for his exceptionally successful career working with companies like IGN, HP, and now Nasdaq. An AMA attendee asked about hiring, and Aaron shared a an explanation of his team makeup, and his views on the types of designers he hires. He has lots of generalists on his team. At any given moment a designer on his team may be coding, creating a prototype, cranking something out in Sketch or Photoshop, conducting research, or coming up with a new project management strategy. He empowers employees to do what needs to be done. Something very important to his team is that while they have a director of research, the designers still get a chance to participate in the research process and facilitation because it’s so beneficial to their work. When he’s hiring, he looks for someone who’d fit well within the structure of the team, but he also hires for need. Could this person be flexible? Learn new skills? Grow their abilities? It’s important to him as a director that he encourages and helps his team members grow professionally. When an AMA attendee asked about the development and upkeep of personas at Nasdaq, Aaron explained that the products his team works on cater to a narrow audience. They’re working on an investor relations application, and even though the audience is narrow, he and his team revisit the personas they’ve created to make sure they still make sense, and they update them over time. He said it’s important to have best practice design principles you work toward, but you need to be willing to throw something out. If a process works great for you now but you flip to a new project, what works currently may not perfectly map across to the new team. Be willing to take the time to observe and identify what’s working well and what isn’t , and figure out a new way to do things that will work best with the new team. When asked about the role of design principles in his organization, Aaron explained that remaining flexible and being resilient is of the utmost importance. It’s not a skill like user research or coding, but it’s equally—if not more—important. Big companies change at the drop of a hat. They may have a primary focus, then a revenue opportunity comes up and your focus has to shift from what used to be primary to that project, then another item you’re working on may get sunsetted if it’s not making enough money. I could probably write an entire thesis on the rest of his AMA, but instead of just reading about it, why don’t you watch it? You can catch the full recording of Aaron’s AMA here. Loving Aaron’s advice? You’ll love his book just as much! You can pick up a copy of Discussing Design here. You can also follow his blog at Medium and catch up with him on Twitter. Huge thanks to Jake Rogelberg of Designer Hangout for hosting yet another stellar AMA! UX and Content Strategist at InVision and UX Blogger at UserExperienceRocks.com. Fan of: my daughter, photography, writing, and beautiful usable things.